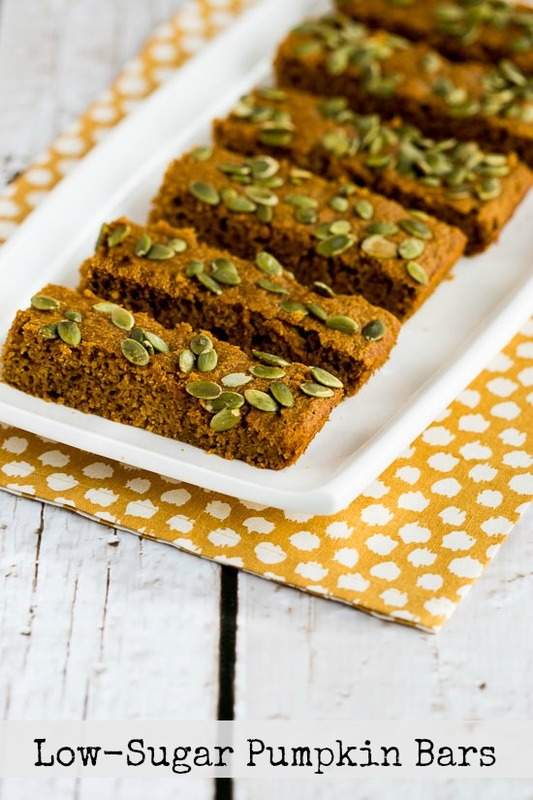 These Low-Sugar Pumpkin Bars are perfect when you want a pumpkin bar that doesn’t have much added sugar and this tasty pumpkin treat is also dairy-free. Make them with all sweetener if you prefer. Use the Diet-Type Index to find more recipes like this one. 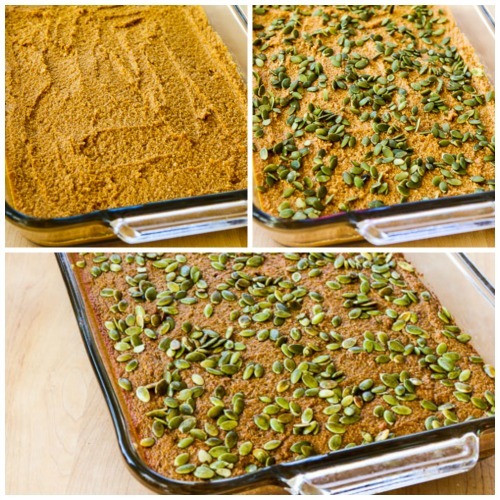 Click here to PIN Low-Sugar Pumpkin Bars! I have a friend who blogs at The Perfect Pantry, and she’s always reminding me that even though I think there’s a schedule for this blog, in reality that schedule only exists in my mind. Lydia even says that most readers will never notice if I abandon the schedule, so maybe I don’t need to apologize at all for skipping Meatless Monday this week and going straight to Low-Sugar Pumpkin Bars so I could get them posted before Halloween! And it’s about time that this recipe saw the light of day! Last year in October I went to a party where the hostess served Paula Deen’s Pumpkin Bars. I’m not the biggest pumpkin fan but I did have a taste, and people were raving about them, so I decided to try coming up with a healthier version of the pumpkin bars. But it took me several tries to get a low-sugar version I was happy with, and by then Halloween was long gone and Thanksgiving was approaching, so I decided to save the recipe for 2016. Then I nearly forgot about it, and when I did discover the photos in a draft post I didn’t want to wait any longer to share this recipe! I used a tiny bit of brown sugar with my preferred Stevia-in-the-Raw granulated sweetener, but you can use any sweetener you like, or skip the brown sugar and use all sweetener if you want a pumpkin bar that’s even lower in sugar. I also used coconut oil, but again use whatever oil you prefer. Paula Deen used regular flour, but I used a combination of White Whole Wheat Flour and Almond Flour, which makes this a more low-glycemic recipe. And the almond flour and coconut oil added a lot of good flavor! Paula Deen used frosting of course, but I topped them with some pumpkin seeds, and I thought these pumpkin bars were delicious for a healthier treat that was just a little bit sweet! Beat together the eggs, Stevia granulated, brown sugar, melted coconut oil, and pumpkin in a large bowl. 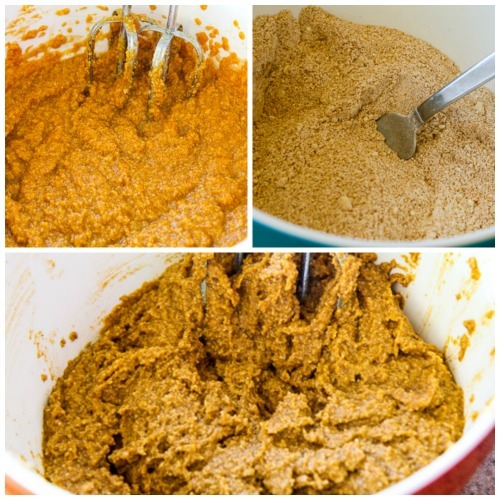 In a separate smaller bowl, stir together the white whole wheat flour, almond flour, baking powder, baking soda, cinnamon, pumpkin pie spice, and salt. Mix the dry ingredients into the wet ingredients. Spread the mixture out into a 10 1/2″ by 15″ baking dish that you’ve sprayed with non-stick spray. Sprinkle with pumpkin seeds. Bake in a preheated 350F/180C oven until the bars are firm and barely starting to brown on the edges, about 35 minutes. Pumpkin bars can be served warm or cold. And normally I wouldn’t advocate cake for breakfast, but I think these would make a fun breakfast for Halloween! These Low-Sugar Pumpkin Bars are perfect when you want a pumpkin bar that doesn’t have much added sugar. Beat together the eggs, Stevia granulated sweetener, brown sugar, melted coconut oil, and canned pumpkin in a large bowl. In a separate smaller bowl, stir together the white whole wheat flour, almond flour, baking powder, baking soda, cinnamon, pumpkin pie spice, and salt. Mix the dry ingredients into the wet ingredients, stirring until it’s well combined. Spread the mixture out in the baking dish and sprinkle with the pumpkin seeds. Bake 33-37 minutes, or until the pumpkin bars are firm and starting to get lightly browned on top. Pumpkin bars can be served warm or at room temperature. This recipe was adapted from Paula Deen’s Pumpkin Bars. 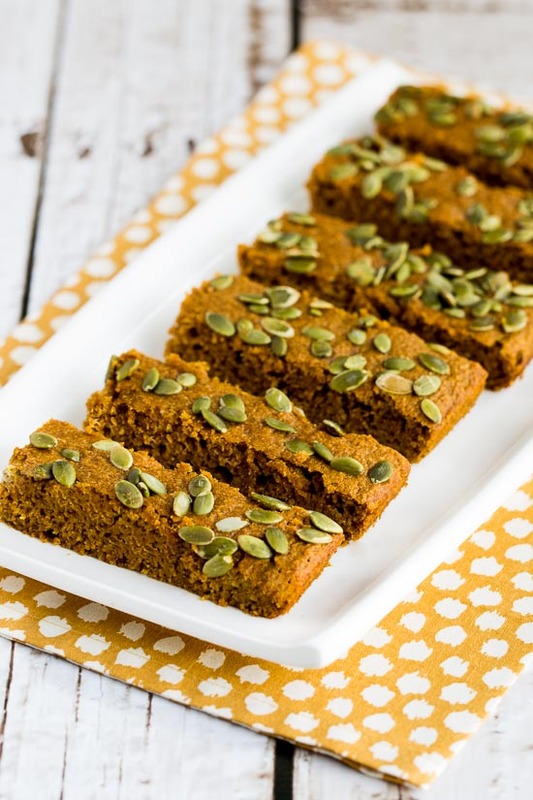 If you’re following the South Beach Diet or a low-carb diet, Low-Sugar Pumpkin Bars like this with whole wheat flour and some brown sugar are definitely a splurge. You can use all sweetener if you want a pumpkin bar with even less sugar, but even that version is probably phase three for South Beach. Pumpkin isn’t low in carbs, so this is too high in carbs for traditional low-carb diets. What size of canned pumpkin do you use? The big can? Mine is 796 ml. Sorry about that! My can says 15 oz or 425 grams. I will add that to the recipe! Thanks for this healthy treat. Eve, my pleasure. Hope you enjoy. What a fun idea for a Halloween party! I love the color contrast, too, between the bars and the pumpkin seeds. Thanks Lydia; they really were good for a healthier pumpkin treat. You're welcome Luke; hope you enjoy trying the recipe! thank you for de-sweetening this recipe, it's good to know that it works with whole wheat flour (at least partially) too, thanks again for this!